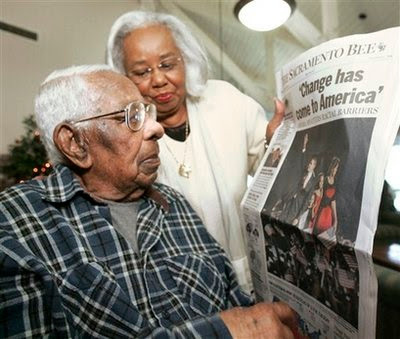 George Francis, the nation's oldest man who lived through both world wars, man's first walk on the moon and got to vote for the first black president, has died. UCLA gerontologist, Stephen Coles, who maintains a list of the world's oldest people, said Francis lived 112 years and 204 days. Read entire story here. I really liked that photo that you posted. It was cool that Mr. Francis did live long enough to see Obama win the election. I read that story earlier today in the local paper, and it made no mention of Francis' ethnicity. In light of that, Malcolm's right to point out the irony of the past election. Wow he has seen it all.